California’s Stickup Kid has never been a band to fill a certain mold. The progression from The Sincerest Form of Flattery to the 2012 EP, Nothing About Me, was very noticeable. One thing was for sure, they always played fast. The first single off of their debut Adeline Records LP, Future Fire, presented a new approach on their sound that made complete sense coming from Nothing About Me. 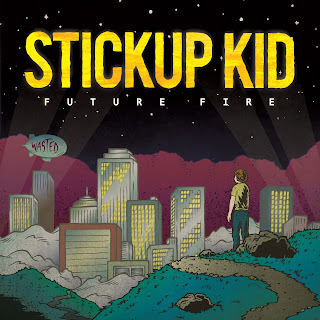 After two more songs were released, I began to think that Future Fire was going to be a whole new, revamped Stickup Kid. This record was a huge surprise, but in the best way. “Lost” starts the record off a bit slower than what most people are going to be expecting. The vocal harmonies are absolutely beautiful, as well as the instrumentals. Future Fire welcomes you with one hell of a ballad, which eventually turns into the aggressive Stickup Kid you know and love. Then an assortment of catchy, bouncy riffs lead you right into “The Depths of Me,” a track that contains the vibes from Nothing About Me, but on a much larger platform. This is also the first of many humongous choruses on the record. “What’s Missing” has some very interesting guitar riffs that surfaced thoughts of Third Eye Blind. Already, every song on the record sounds completely different, but at the same time, it still feels like Stickup Kid. “Good People in a Place I Hate” has a darker sound to it. A very heavy bassline roars throughout the verses, leading into a very loud, catchy chorus. It seems the song just continues to build more and more, until finally going out with a huge bang. What can I say about “Keeping My Distance”? It is probably one of the best songs this band has ever written. It’s just simply an incredible song that contains a chorus that you will be humming for hours after your first listen. “Chariot” feels like a 90s punk rock anthem; it’s a very fun track. Little intricate things like palm mutes, and little riffs in between vocal parts give this song so much character. Following “Chariot” is “Through the Night”. I think my dad described this song best when I decided to show it to him. He stated, “If there was a punk rock song on Grease, this would be it.” It’s truly an accurate description. It may sound weird, but it works. Track eight, “Gotten Away”, is extremely experimental for the band. Most of this record is completely new for Stickup Kid, but this song is by far the most different. It’s a beautiful thing when a long song keeps your attention the entire time, and “Gotten Away” does just that. It also really shows off the abilities of the vocalist. “This is Over” has one of my favorite choruses on Future Fire. It’s your normal rock song with a Stickup Kid twist. Next up, and bringing the undeniably catchiness back to the table, is “Wasted”. As soon as the song starts, you’re bobbing your head along with the guitars. “Tailwind” closes Future Fire very tastefully. It’s nothing too crazy or different, but it feels very big and loud, making for a perfect closing track. It also harbors one of the catchiest bridges that has ever graced my ears. “Tailwind” is an incredible farewell from Future Fire. There are two very shocking things about Future Fire: Stickup Kid's progression, and how the album flows so well when the songs sound so different from one another. Every single chorus on this record sounds huge. There wasn’t one time when I wanted to skim through a track. Future Fire keeps your attention, and with that rewards you with 11 super catchy, super different tracks. This is a huge step for this band, and the pop punk or punk rock genres alike. As a whole, this record is incomparable to any other. Most bands play it safe when releasing a record that could either make or break them, but Stickup Kid decided not to do so. They tried something different – 11 times at that. Plain and simple, Future Fire is one brilliant punk rock record. Be sure to pick it up through Adeline Records on July 9.